For pecan tree sales contact our pecan tree nursery today! With over 43 years experience in the pecan growing industry we are not only happy to provide our customers with quality nursery stock, but we are also available to provide educational information on select pecan varieties, planting pecan trees, maintaining pecan trees, designing orchards, and discussing results that growers can expect to see. Did you know that Texas is the very center of the pecan trees’ native habitat? Pecans have been important to the area as long as people have been living there. Many animals, such as deer, turkey, raccoons, squirrels and crows also rely on pecan trees for sustenance. In addition to their use as a food producing plant, Texans also rely heavily on pecan trees to provide much-needed shade in urban environments. While the pecan tree has lots of roots in Texas, Georgia is the top producing pecan state in the U.S. Located in Valdosta (Lowndes County) Georgia, Georgia Pecan Nursery is a licensed live plant pecan tree nursery with over 43 years of experience in growing, designing, installing, & maintaining pecan orchards. Pecan trees produce both male and female flowers on the same plant but they’ve evolved successfully by cross pollinating with other varieties and cultivars. Each plant will develop it’s male and female flowers at different times; this is to insure that they’ll mix pollen with other plants rather than self-pollinating. That means certain varieties and cultivars make good cross-pollinating partners, and others don’t, depending on when their male and female flowers emerge. If your pecan tree hasn’t developed fruit for a number of years, it’s possible that there isn’t a compatible cross-pollinator nearby. Pecans reach maturity at about twelve years old and can live as long as 300 years. Many varieties are considered alternate-bearing including ‘Cape Fear’, ‘Creek’, and ‘Pawnee’. This means that one year they’ll produce large quantities of nuts and the following year they’ll produce smaller harvests. 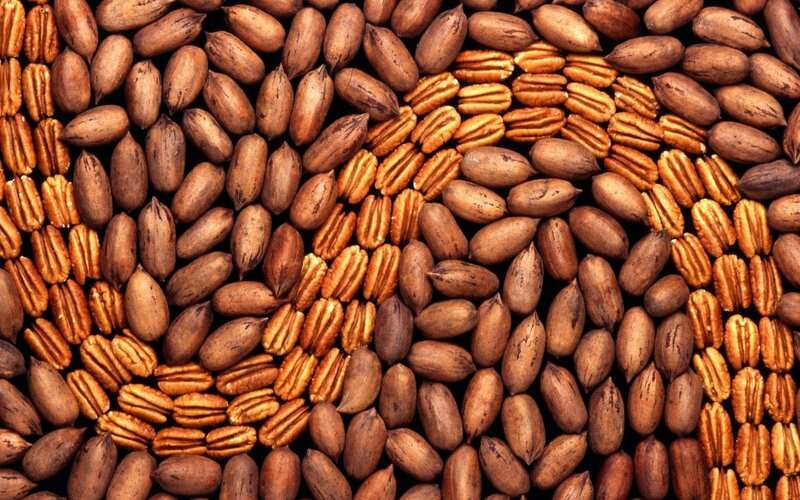 During the years pecans yield large harvests, nutrients are depleted much more quickly. Be sure to feed them more heavily during these years. Pecans are not technically a nut, but a drupe, a fruit surrounded by a husk with a single stone or pit in the center, which is the part you eat. Pecan wood can be used to make furniture, flooring as well as smoking chips to add flavor to grilling.